Judge Mr Paul Humphrey from East Dean, West Sussex, was presented with a good line up of sheep in many of the classes. As his Champion Southdown, the judge selected an older ram, owned and exhibited by Jonathan Long. The Champion was awarded the Northumberland Perpetual Challenge Trophy (RASE). The reserve Champion was a shearling ewe bred and shown by Messrs Wakeham-Dawson & Harmer, and awarded the Hazleton Perpetual Challenge Cup (RASE) and the Sheila Colman Trophy for the best shearling ewe. The champion ram continued his success the following day when Interbreed judge Mr Charles Sercombe selected him as the champion of the Terminal Sire Breeds, before crowning him the Supreme Interbreed Champion. Winning the best ram lamb class Cooper Perpetual Trophy for the best ram lamb was Johanna Miller from Redmarley, Gloucestershire. Ms Miller also took home the Miller Hallett Perpetual Challenge Cup for the best group of four sheep. The aged ewe class and the ewe lamb class were won by Mrs E Sargent. 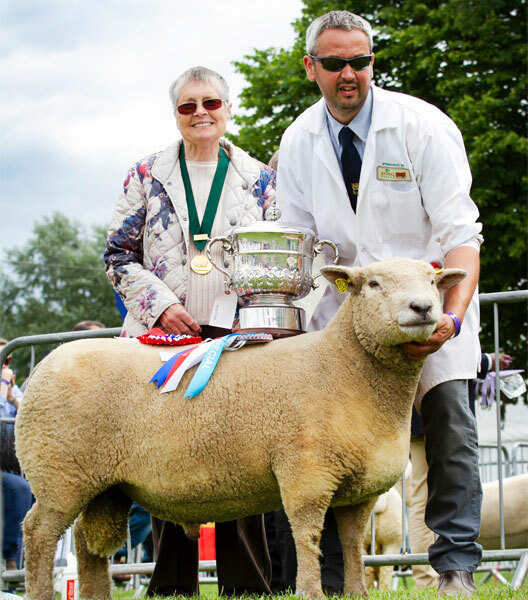 The 2019 National Southdown Show will take place at the Royal Cheshire County Show.